The mammals, which were previously trained by the Ukrainian military, are to be incorporated into Russia’s naval forces following the acquisition of Crimea. Crimean combat dolphins are to serve in the Russian Navy. The Sevastopol State Aquarium is preparing to start training the mammals for new programs in the interests of the Russian fleet, according to an associate of the aquarium who spoke on condition of anonymity. The bottlenose dolphins and fur seals were previously trained for combat by Soviet programs in the interests of the Ukrainian Navy. After lapsing following the collapse of the USSR, the program was resurrected in 2012 by the Ukrainian military. Now Crimea has joined the Russian Federation, the aquarium and the dolphins have become de facto Russian. Dolphins were first used for military purposes in the United States in 1960, and the mammals have seen combat as recently as the Gulf War. In the USSR, a research center for combat dolphin training opened in 1965 on the Black Sea coast, where combat dolphins were mainly used to patrol the entrances to a naval base, detect potential enemy divers and search for mines. For some time, bomber dolphins were also trained and were to be responsible for knocking out enemy ships. Today, there are only two combat dolphin training centers in the world, based in San Diego (the U.S.) and Sevastopol. "Engineers are developing new aquarium technologies for new programs to more efficiently use dolphins under water," the spokesman said, noting that dolphins and seals will be used to search for sunken objects and military equipment as well as for the detection of enemy divers. According to a source, the combat equipment currently in use for the mammals is very outdated. "Our specialists developed new devices that convert dolphins’ underwater sonar detection of targets into a signal to the operator's monitor. But the Ukrainian Navy lacked funds for such knowhow, and some projects had to be mothballed," said an associate of the aquarium, adding that he hopes that the Russian Navy will have the means to continue special training for combat dolphins and seals. However, RIA Novosti commentator Sergei Petukhov was more skeptical. "To make a killer or a kamikaze out of a dolphin is no harder than [to make one] out of a dog. But the results will be just about the same. 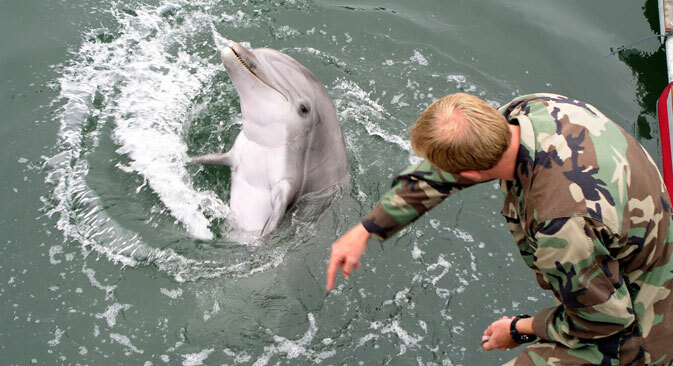 Eventually the military will have to abandon the use of combat dolphins just as they have with combat dogs, combat camels, combat elephants and even horses, cavalry," he said. According to him, the main problem in dolphin training is the need to teach them how to distinguish "us" from "them". "It is possible to teach a dolphin to distinguish a comrade from a stranger if you mark strangers with any type of label - visual, chemical, acoustic, hydro-acoustic. But marking enemies in a war scenario, for obvious reasons, will not work. We will have to mark our comrades," noted Petukhov. However, this only partially solves the problem. "If the task was to teach the mammals to bring over marked objects with their snout, success could be achieved, if not one hundred percent then close to it. But to teach the mammals not to touch the marked objects, but to chase all the others regardless of their shape, size, smell, vibration and the like, is much more complicated. The probability of error increases to dangerous levels," said Petukhov.